Coming To A Screen Near You: A 3-D Clash In the wake of the blockbuster success of Avatar, Hollywood studios are rushing to release more movies in 3-D. The problem: There are only a limited number of studios with 3-D technology, leading to a traffic jam of sorts that's coming in the next few weeks. 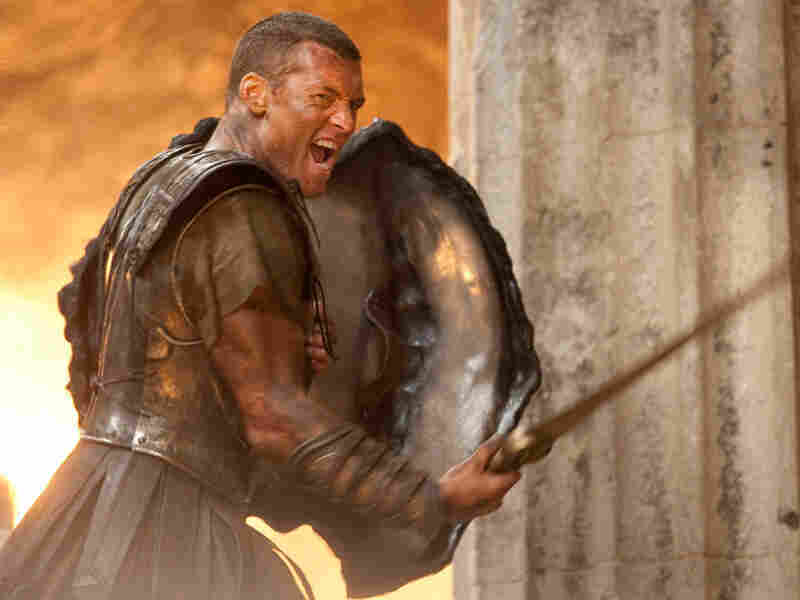 m>Avatar star Sam Worthington returns to the realm of the 3-D blockbuster as Perseus, son of the god Zeus, in Clash of the Titans. It's one of several 3-D pictures currently competing for space on a big screen near you. It seems that lately there aren't enough theaters to house all the 3-D movies. What's going on? There is a glut of 3-D product coming onto the market. There are now maybe 4,000 3-D screens in the U.S., in a world where a big movie might open on 3,500 screens. And for a while, Hollywood was hanging back to see what would happen and whether 3-D would catch on. Then Avatar happened, and now everyone's scrambling to make sure their popcorn movies -- their big tent-pole pictures -- can be seen in 3-D. So along comes How to Train Your Dragon this Friday, and Warner Bros. is coming in with Clash of the Titans next week, and there's still Alice In Wonderland -- and even Avatar is still playing on some 3-D screens. So there is in fact a traffic jam. Does the audience really care that the movies are in 3-D? Would they be going to Alice In Wonderland anyway? Avatar made more than 70 percent of its money from 3-D, so that was a pretty convincing argument, and one that Hollywood heard. And, you know, it's an ironic situation, because Jeffrey Katzenberg -- the head of DreamWorks Animation, which is bringing out How to Train Your Dragon -- has been one of the great 3-D evangelists, saying, "Please! Convert your screens to 3-D! This is the future. It's a huge revolution -- like going from silent to talkies -- it's going to become the standard." But no one believed him until Avatar came along. And now it's his movie, How to Train Your Dragon, that could be the victim of this traffic jam: Clash of the Titans was originally shot in 2-D, but Warner Bros., seeing the success of Avatar, transformed it into 3-D and jammed it into the release calendar just a week after Katzenberg's movie. So now there's a war going on over who's going to get which screens -- if you're a theater owner, is it going to be How to Train Your Dragon, or are you going to hold out for Clash of the Titans? You mentioned that Clash of the Titans was converted after the fact, but do viewers even know the difference? So, do you think 3-D is in a fad phase? Or is it something that's here to stay? We are well beyond fad phase. Theater owners are adding 3-D screens just as fast as they can. And I think the answer to the concerns of a James Cameron is that, as 3-D becomes the standard, directors and producers will need to make high-quality 3-D movies, because people become used to new things pretty quickly. And there are people -- including me -- who think that this will in fact become the standard, and pretty soon we'll even be watching 3-D movies at home. Kim Masters is host of The Business on member station KCRW.